I'm sure it isn't news to you that many people are not saving enough for retirement. For some, there just doesn't seem to be enough money to pay the bills and save. However, for others, faulty assumptions may be to blame. Consider the statements below. Have you ever thought or said such things? If so, they might be keeping you from saving as much as you should for your later years. 1. "I'll be able to earn income as long as I'd like to." A growing number of today's workers are planning to keep working past the typical retirement age. However, their plans don't square with the experiences of today's actual retirees. According to the latest Retirement Confidence Survey from the Employee Benefit Research Institute (EBRI), 38 percent of today's workers expect to retire at age 70 or later, or never retire. How does that compare with today's retirees? Just 4 percent actually left the workforce that late. Among retirees who left the workforce earlier than planned, EBRI says many did so "because of a hardship, such as a health problem or disability." Others retired early because of "changes at their company." This same expectation/reality gap can be seen in the number of workers who plan to work for pay after they retire. Some 79 percent say that's their intention whereas just 29 percent of current retirees have actually worked for pay. What should you do? Instead of counting on paid work in your later years, plan financially to retire at the typical retirement age. At the same time, keep your vocational skills current so you could keep working if you'd like to and are able to. 2. "Inflation will always be low." If you want to do a checkup on your retirement savings, you may be tempted to take your total nest egg and divide it by the number of years you think you might live. This will give you an idea of how much money you'll have each year to cover your annual costs. When you have enough to get by, you might assume you're "set." There's just one problem with that approach, which people often forget about: inflation. While the cost of living has only been increasing at a relatively moderate rate in recent years, even a 2 percent rise means $500 worth of groceries today will cost about $600 in 10 years. And who knows how long inflation will stay low? 3. "I'll always be healthy." When you're in good health, it's hard to imagine ever becoming seriously ill. Heart attacks, strokes, cancer, and dementia only happen to other people, right? That assumption may explain why so many people are ignoring resources that could be used to help pay health care expenses later in life. EBRI found that only 13 percent of account holders contributed the full allowable annual amount to their health savings account in 2016. Meanwhile, according to The LTC Financing Strategy Group, only 16 percent of eligible people over age 65 have a long-term care insurance (LTCI) policy. Cost certainly is a factor in these decisions, but an assumption of continued good health may play a role as well. What to do? Face the facts. You probably won't always be as healthy as you are today. According to the National Association of Insurance Commissioners, over half the people turning 65 are expected to need long-term care at some point in their remaining years. 4. "If I ever do become seriously ill, my kids will be there for me." What if you do experience a debilitating illness — one that leaves you needing help with some of the activities of daily living? If you're like most people, you'll probably prefer to avoid living in a nursing home, but what other options would you have? Think about your children. How old will they be when you are 80 or 90? Will they be available, or will they be busy building their careers, raising their own kids, or both? Are they likely to live near you? Counting on your adult kids to help care for you may be counting on too much. Here again, a long-term care policy may be in order. Most of today's LTCI policies will help cover the cost of a nursing home and in-home care. Among the many threats to a financially secure retirement, the difficulty many of us have envisioning the circumstances we'll face in the future is one of the most significant. It can lead to faulty assumptions that, in turn, can leave us unprepared for our later years. 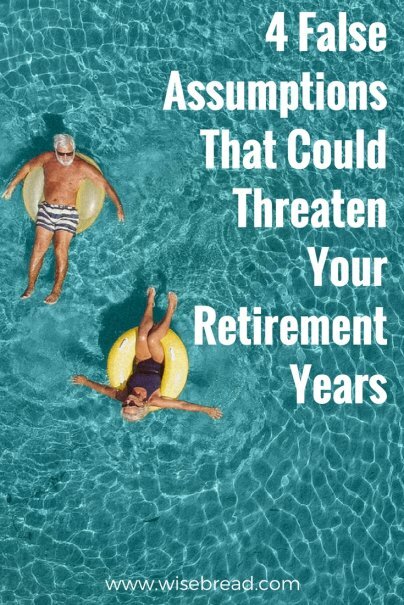 The good news is, if we realize early enough that we hold these false assumptions, we can change them and correct course so that we are financially secure in our later years.